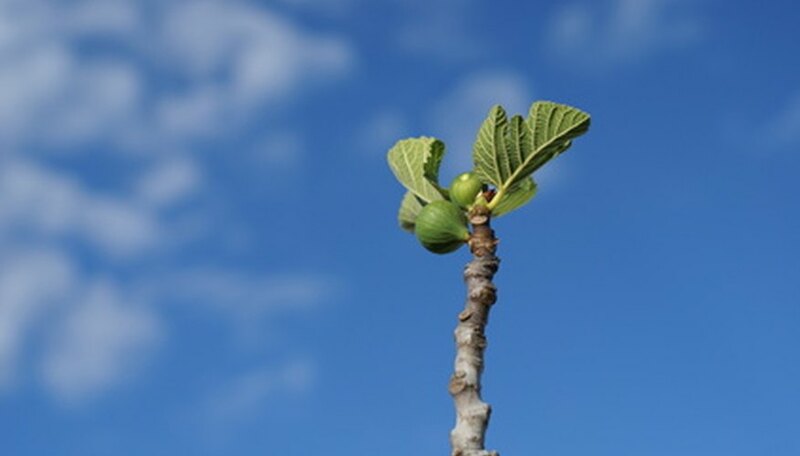 Growing a fig tree from cutting a shoot off of a mother tree will produce an identical offspring. You can use the limbs that are removed from the fig tree in late winter from pruning. After placing the young shoot in a potting soil and sand mixture, new leaves will appear in less than three weeks. In most cases by early May, the new shoots will be ready to place in the ground and literally take off. Basic tools are all that is required for growing new fig trees from a mother plant. Prepare the potting soil before any pruning takes place. The shoots or cuttings must be placed into the potting soil immediately after cutting. Mix together three parts potting soil to one part sand. Fill the 6-inch plastic pot to the top rim. Most 6-inch pots will use 2 quarts of soil. Up to five shoots can be placed into a single 6-inch pot. Be sure that the plastic pot has large drainage holes in the bottom. This is key as the pot cannot retain water in the bottom, it will rot the fig cuttings. Take cuttings from the mother plant that is ¼ inch to 3/8 inch in diameter and 8 inches to 10 inches long. Use a knife or a pair of pruning shears. The pruning shears must be of the double-knife type and not an anvil shear. Anvil shears will crush the pruned stem. Cut the small stems at an angle, not straight across. The angle cut will provide greater surface area for rooting of the shoot. Dip each cut end of the shoots into the rooting hormone. Cover the lower end approximately 1 1/2 inches to 2 inches in the white powder. Insert the fig cutting into the potting soil, cut end down. Immerse the stem approximately 4 inches deep. Arrange the stems in a circular fashion around the pot about 1 inch from the inner edge. Use the knife and cut the bottom from the 2-liter soda bottle. Remove only the lower 1-inch of the plastic bottle. Keep the screw cap in place. Water the new cuttings thoroughly with water. Add water several times to soak the new cuttings into the potting soil. Let the cuttings set for six to eight hours to drain any excess water. Place the 2-liter soda bottle over the cuttings in the pot. This will make a mini-greenhouse. Set the pot in a window that does not have direct sunlight. Direct sunlight will cause the fig cuttings to over-heat and dry out prematurely. Leave the cuttings alone--do not touch or lift the soda bottle. Observe leaf growth after three weeks. Lift soda bottle from pot after three weeks. There should small green leaves on the stems. Add one cup of water only to the pot. Replace soda bottle. Set back in window. Leave alone for two weeks. Remove soda bottle after leaves reach greater than ¾ inch. Water the plant thoroughly. Allow excess water to drain. Place back in window. Water the fig trees once a week or more often if the plant’s leaves begin to droop. You cannot over-water the new trees since you are using a pot with drainage holes. Add a liquid fertilizer once every two weeks until you place the trees into the ground. Place the new trees outside at the end of April for a few hours each day. This will harden off the plants. Place the trees in the ground the first two weeks of May, when the ground temperature is above 60 degrees F. Water up to 2 inches each week.